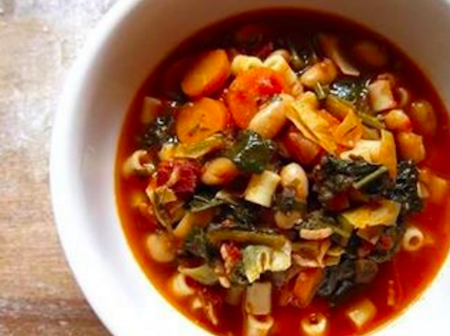 Please note I change my minestrone soup every time I cook it to keep it fresh, different and always enjoyable to eat! Add the beef stock, beans and canned tomatoes to your pot, cover and bring to the boil. Reduce heat to medium-low. Simmer, covered, stirring occasionally, for 30 minutes or until the vegetables are tender. Increase heat to high. Add pasta and cook, uncovered, stirring occasionally, until pasta is al dente. Season with salt and pepper. If your adding spinach or kale to your miestrone, add them now and let them cook for a couple minutes. Ladle into serving bowls and sprinkle with parsley and parmesan.